(Rick Egan | The Salt Lake Tribune) Dallin McAllister performs on Main Street in Salt Lake City, Thursday, Aug. 16, 2018. The first Salt Lake Busker Festival is set for Aug. 24 on Regent Street, bringing together street musicians, magicians, jugglers and other performers. Flat-soled tennis shoes don’t have the same flexibility as ballet slippers, but “they’re good for cushioning cement” when Salt Lake City’s Municipal Ballet Co. is performing for crowds on downtown sidewalks, says dancer, founder and director Sarah Longoria. Kim Angeli wants to change that. One way she’s trying: SLC Busker Fest, a celebration of street art scheduled Friday, Aug. 24, on Salt Lake City’s Regent Street. Admission is free, though as always with street performers, tips are greatly appreciated. Angeli is determined to get more street performers in Salt Lake City, a place that hasn’t always been receptive to the idea. “There is a feeling among street performers that they aren’t welcome,” Angeli said. In New York and other cities, subway stations and public transit centers are popular spots for buskers. Not so in Salt Lake City, where Utah Transit Authority ordinances ban any nontransit activity or speech from UTA property, such as TRAX platforms. Angeli also blames poor communication about the city’s ordinances covering street performers and vendors. The ordinance allows street performers to work downtown, Angeli said, if they get a $30 annual license and stay in designated areas. The uncertainty has led many Salt Lake City buskers to gravitate to the Downtown Farmers Market, Saturdays in Pioneer Park. It’s become so popular that the market now has rules to limit the number of performers at the already-crowded event. Angeli hopes SLC Busker Fest will help spread the wealth, and connect performers and audiences. McCulley has been performing at Renaissance fairs, farmers markets and other open-air venues since 2007, when she started as a fire-eater. She began to learn magic a couple of years later from a then-boyfriend, and on occasion makes balloon animals. Her signature trick is a 100-year-old illusion involving three pieces of rope, which she transforms from different lengths to equal lengths. Busking, having to keep a mobile crowd engaged, can be intimidating for performers, McCulley said. Musician Dallin McAllister’s favorite, and most lucrative, spots for busking are wherever the people are — City Creek Center during the day, farther south at bars and restaurants during the evening. “You have to follow the crowd,” he said. McAllister, who performs five days a week downtown, finds that his repertoire of big-band jazz standards can usually connect with any crowd. “Everybody respects it and likes it, whether you’re 90 or 9,” said McAllister, who claims the 1964 show tune “Feeling Good” — covered by Nina Simone and Michael Bublé — as his signature song. (Rick Egan | The Salt Lake Tribune) Dallin Mcallister performs on Main Street in Salt Lake City. The first Salt Lake Busker Festival is set for Aug. 24 on Regent Street, bringing together street musicians, magicians, jugglers and other performers. Thursday, Aug. 16, 2018. (Rick Egan | The Salt Lake Tribune) Dallin Mcallister performs on Main Street in Salt Lake City. The first Salt Lake Busker Festival is set for Aug. 24 on Regent Street, bringing together street musicians, magicians, jugglers and other performers. Thursday, Aug. 16, 2018. (Rick Egan | The Salt Lake Tribune) Dallin Mcallister performs on Main Street in Salt Lake City. The first Salt Lake Busker Festival is set for Aug. 24 on Regent Street, bringing together street musicians, magicians, jugglers and other performers. Thursday, Aug. 16, 2018. (Rick Egan | The Salt Lake Tribune) Dallin Mcallister performs on Main Street in Salt Lake City. The first Salt Lake Busker Festival is set for Aug. 24 on Regent Street, bringing together street musicians, magicians, jugglers and other performers. Thursday, Aug. 16, 2018. During the day, he’s often performing under the skybridge connecting the two halves of City Creek Center. “The foot traffic’s good,” he said. “People are getting on the TRAX or heading home from work." Playing to the crowds caused “sort of an uncontrolled atmosphere” at the Saturday farmers market, said Alison Einerson, who runs the Market Musician program. Performers were setting up in vendor spaces or blocking foot traffic, she said. This season, the Downtown Alliance, which manages the farmers market, instituted new rules to regulate the number of street musicians in the park. The market has designated eight locations along the park’s perimeter for street performance. (The middle of the park, including the area where the old performance stage was, is fenced off this year for a renovation project.) Those wanting to participate must sign up for a time and location, Einerson said, provide an audio file and a playlist, and pay a refundable $10 deposit. “We want people to be serious about it,” she said. No matter what, street performers “lend themselves to an urban environment,” Angeli said. For Longoria and her dancers, the thrill of connecting face-to-face with the crowd makes up for the slightly limited movement that comes with the street-ready sneakers. 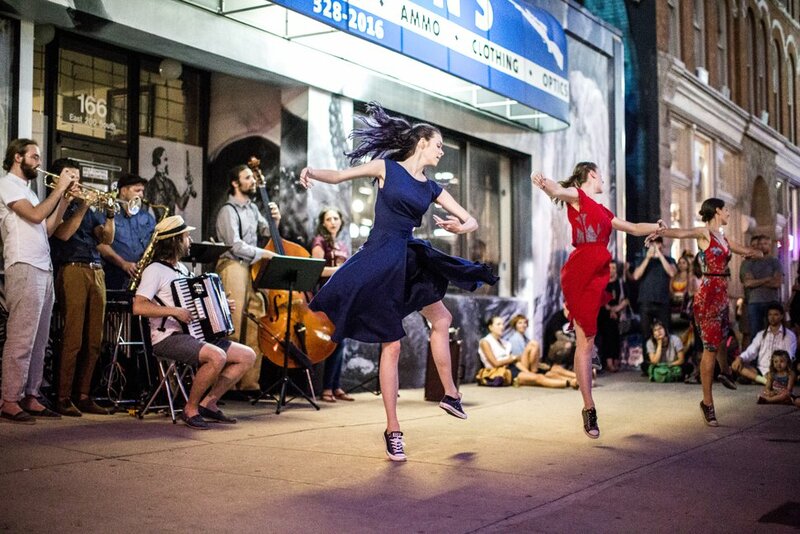 Performing on the street means spectators “can see you breathing,” said Longoria, the troupe’s founder and director. “You’re on the same level … rather than the separation of the dark audience and the bright stage. (Jon Burkholz | photo courtesy Municipal Ballet Co.) Members of Salt Lake City's Municipal Ballet Co. performing on a downtown Salt Lake City sidewalk in 2013. The troupe is one of the acts performing at the first SLC Busker Fest, a celebration of street art that will include musicians, magicians, aerialists, jugglers and dancers. The event is set for Friday, Aug. 24, 3 to 10 p.m., on Regent Street between 100 South and 200 South. A celebration of street performers, including musicians, dancers, jugglers, aerialists and magicians. • Where • Regent Street, between 100 South and 200 South, behind the Eccles Theater on Main Street, Salt Lake City. • When • Friday, Aug. 24, 3 to 10 p.m.
• Admission • Free, though performers will be passing the hat for tips. • Out-of-state talent • Two national touring artists are on the schedule: Bekah Juggler, from Boulder, Colo., who performs juggling, fire and unicycle tricks; and Brent Fiasco, from Phoenix, who performs juggling and sideshow antics. The rest of the line-up is from Utah. • How it works • Two large performance areas have been designated along Regent Street, with a third circle for magic acts. Free workshops by Bekah Juggler, Brent Fiasco and magician David de Carolis are scheduled. And musicians will be rotating up and down the street.